To say that the future of Nigeria lies in the children’s potentials cannot be overestimated. Every parent’s dream is for the child to have better opportunities than they did. As we celebrate Independence Day yet again, it is only proper that we evaluate what we as individuals have done and can continue to contribute, to chart a better course for the future of Nigeria – its children. Did you know that a child’s socioeconomic status can affects his/her school performance? In our experience, we have seen that a low socioeconomic status negatively affects a child’s development. Psychologically, a child may lose their self-esteem and optimism and turn to addictions, aggression and exhibit significant behavioural difficulties. Here at Fair Life Africa Foundation, we focus on investing in children, knowing that a positive impact in a child’s life equals impact in the nation’s future. After all, we call our children the “Leaders of Tomorrow”. Our approach is to continue to contribute in our own little way to the betterment of our country, starting from these children that will take over tomorrow’s leadership. Having learnt many lessons from operating the CCC Initiative, we have now set up the Disadvantage to Advantage Initiative, so that more children, who are also more likely to excel as a result of our intervention, can benefit from your support. Consider the case of Sarah, a 12 year old girl, who lives with her mom and dad in Lagos. She’s very gifted and is excelling in Maths and English at school. However, when a fatal accident claims her dad’s life, her mom is distraught, and unable to continue to provide for Sarah and her younger brother and sister. Without the money to pay for a second term in school, Sarah has to drop out to work and help her mother. Sarah’s story is a common story for many children in Nigeria, who are brilliant but disadvantaged! Through this initiative, Fair Life Africa aims to seek out these children within our communities, and with the help of your support and donations, ensure that they achieve their dreams and potentials! So as we celebrate Nigeria today and hope for a greater tomorrow, we request your support in helping Fair Life Africa build the Nigerian future – ONE CHILD AT A TIME. 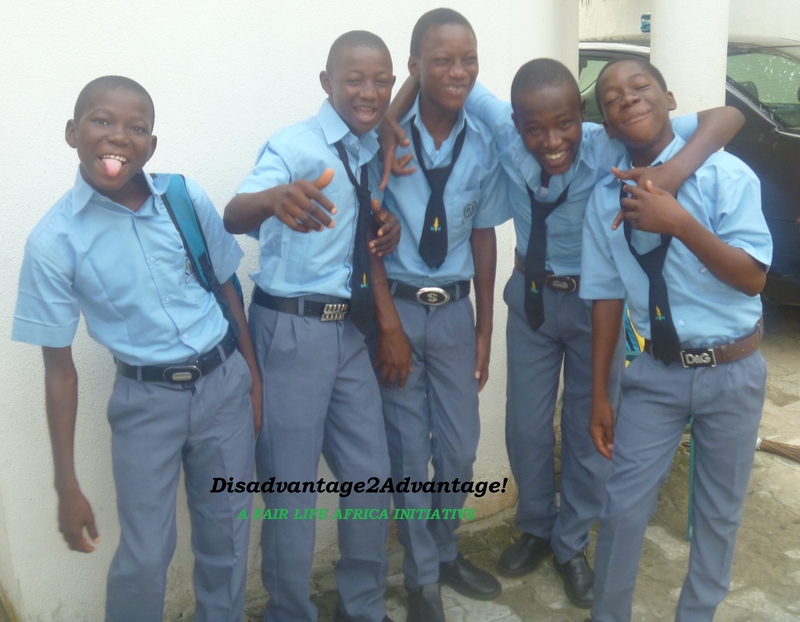 Please visit our GlobalGiving Project page to learn more about our Disadvantage to Advantage Initiative and see how you can get involved and support the work in kind or cash. Thank you! Happy Independence Day from the FLA Team and the FLA Kids! Let us put our hands and resources together to build a world we can all be proud of! Please read and see what Fair Life Africa Foundation is doing. HAPPY INDEPENDENCE DAY to every Nigerian! Hi Rachael, thanks for getting in touch and a Happy Independence Day to you too. We don’t have any Internship programme set up, however, we happily receive volunteers. If you’d like an internship, you can apply for consideration as an intern by emailing us your CV and cover letter to fairlifeafrica@gmail.com. I hope that helps! Have a good night.